$5.5 million dollar settlement in a medical malpractice case against an obstetrician/gynecologist for injuries to an infant during childbirth. $3.5 million dollar settlement for a construction worker, an iron worker, who was injured on the job losing part of his leg. $3.1 million dollar structured settlement against a hospital and obstetrician/gynecologist for the death of a woman during childbirth. $3.1 million dollar settlement for an ornamental iron worker who suffered injuries when he fell off an unsafe ramp on a construction site. $3.1 million dollar settlement in a medical malpractice action for a 68 year old woman who suffered a stroke during surgery as a result of the negligence of an anesthesiologist. $3 million dollar settlement for a construction worker who, while performing his job, was struck by a New York City Sanitation truck suffering leg and back injuries. $2.5 million dollar settlement for a young woman, a passenger in a motor vehicle, which struck a horse on a road on an Indian reservation in Arizona. $2.5 million dollar settlement against the doctors and hospital for failing to diagnose and treat a pneumothorax (collapsed lung). $2.5 million dollar settlement for an ornamental iron worker who fell from a work platform resulting in fractures to both heels. $2.62 million dollar settlement for a structural iron worker suffering leg and back injuries as a result of falling off a scaffold. $1.75 million dollar settlement for a structural iron worker who fell through an open elevator shaft on a job site. $1.65 million dollar settlement against the hospital for the death of a plaintiff who had suffered gunshot wounds during a robbery and was negligently treated at the hospital. $1.5 million dollar verdict for the death of a New York City firefighter whose safety rope broke during a rescue attempt. $1.5 million dollar verdict for a passenger in a motor vehicle who suffered a severe arm injury. $1.5 million settlement for a child thrown from a motor vehicle. $1.2 million dollar settlement for an ornamental iron worker who fell from a scaffold and fractured his hip. 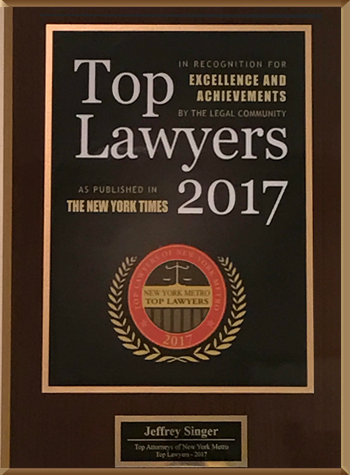 $1.2 million dollar settlement for a woman suffering severe leg injuries caused by a defective roadway in the City of New York. $1.2 million settlement for an ironworker who fell from a scaffold on the construction of the Throgs Neck Bridge repair work. 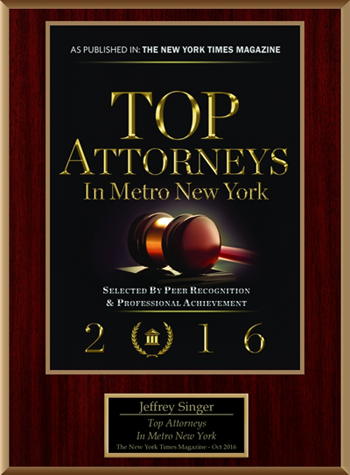 To discuss your case with the attorneys at Segan, Nemerov & Singer, PC, call (212) 696-9100 or click here to contact us online.